There are some fantastic holiday shopping deals that you can grab already! You can get the Lalaloopsy Magic Play Kitchen and Café for only $15.99! That is a BIG SAVINGS of 78% because this cute toy is normally $69.99! 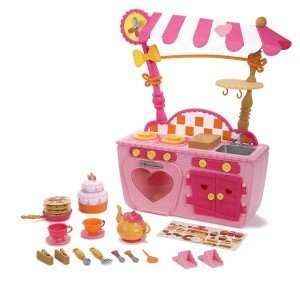 This includes 15+ kitchen utensils/accessories and with two different sides, the adorable kitchen can turn into a café! Make sure that you order soon because the prices can change at anytime on Amazon! CLICK HERE TO ORDER your Lalaloopsy Magic Play Kitchen and Café for only $15.99 today!